Leather logo mockup that you can download and use for free. You get a realistic leather mockup where you can add your logo. You can use this free leather logo mockup in your personal and commercial projects. Add your logo inside the smart object and you get a cool leather logo. 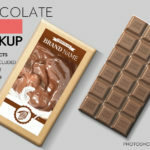 The pack contains 1 layered PSD file with smart objects, that you can download for free. The embossed leather logo and the stamped leather logo styles are editable so you can customize the effect really easily. Download and open the PSD file in Photoshop. Double click on the thumbnail of the smart object called “ADD YOUR LOGO INSIDE”. Add your logo inside the smart object and save (Control-S) to see the result. If you want you can replace the leather texture but you have to choose a smooth leather texture. You can also change the color of the leather using the Hue/Saturation adjustment layer that is included in the PSD file. Change the hue and/or the saturation of the Reds channel. For the preview I used vector badges. This leather mockup works great with Rubber Stamps also. So, you can create your own stamp logo using this Photoshop action. The man silhouette from the preview was made using this Vector Shape Photoshop Action.